2Wheel Chick: One day one photo - 1: Ciao Charlotte Easton! It's that time of year again when I do my one day one photo series. So over the next month I will be putting up my photo of the day. A lot of it will be cycling-related, some of it won't be. Hopefully, it will all be interesting! Unfortunately, this first post is sad, and will be a bit longer than other posts as it is a tribute, which is only fitting for a great girl. Just over a week ago we lost Charlotte Easton, a young lady who had been a stalwart of the women's cycling scene in London, and a pretty good bike racer at that. I first met Charlie in the summer of 2006 when I was getting back into cycle racing following a "quiet" year which had included spending time travelling around South America. Charlie was getting into cycle racing following many years as an elite rower. She was very enthusiastic and keen to chat to all the local newbie cycle racers, giving them encouragement in their sport. At that time women's racing in London was a little thin on the ground and it was not uncommon to show up for a women's cycle race to a field that was barely into double figures. But things slowly began to change, and that was in no small part down to Charlie, who, with the backing of her then club, London Dynamo got many women on board in her club through weekly Saturday morning cycling skills sessions in Richmond Park. 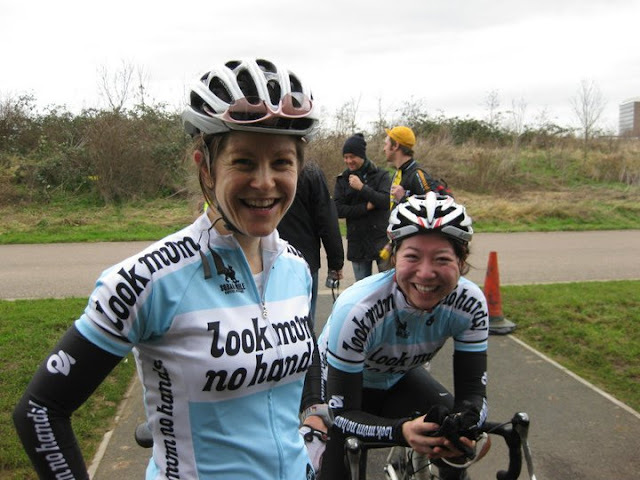 In 2008 Charlie and myself set up the London Women's Cycle Racing Facebook group, as a way to get London women racers networking between ourselves about races. 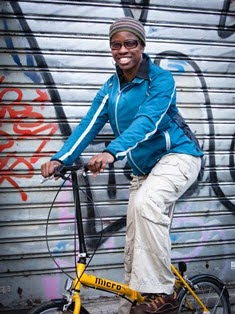 We then came up with the idea of the London Women's Cycle Racing League in 2009, and other local racers like Maryka Sennema, Liz Rice, Rebecca Slack and Rachel Jarvis, plus John Mullineaux came on board and got this initiative off the ground. Charlie's then boyfriend, Sam Humpheson (whom she married 3 weeks before her death) and some friends of his were in the process of setting up the Look Mum No Hands! cycle cafe and workshop on Old Street. By way of raising the profile of the cafe, and supporting women's racing, we were sponsored by LMNH. It was a great year for us all, especially as we saw more women getting into racing in the 2010/2011 season. When I first met Charlie we were similar in cycling ability. But she very quickly steamed ahead and left me and a lot of other people behind as she put in an enormous amount of hard work, sweat and blood, battling to get the win. A few of us were regulars who would see each other at the local races at Crystal Palace Park, Hillingdon Circuit, Hog Hill/Redbridge Cycle Circuit, MOD Chertsey, and not so local races at Goodwood, Thruxton, or the Midlands. Sometimes I would make a last minute decision to compete in an obscure race somewhere in the styx thinking I'd get there and not know any of the other racers. As I didn't have a car I would take the train to the nearest station to the event and cycle the rest of the way. On my arrival at the venue, who would I find also arriving by bike? Charlie! She didn't drive in those days, though she would usually win back at least some of her train fare in prize money, where I would go home empty handed! Charlie was gutsy when racing - she had a few crashes, even breaking bones or getting concussion. But she always got back up. She could also be quite abrasive with other racers and gave them a hard time if she thought they weren't doing their share of work in a breakaway or if they were cutting people up! But she was a grafter with a good heart, and wasn't one to make excuses about her lot. She was well up there on my list of can-do girls! Charlotte, in an interview I did with her for the London Cyclesport website, put her grittiness down to having grown up in a tough mining village up in County Durham. Sadly, Charlie was afflicted by an inherited BRCA2 gene mutation that gives women a higher-than-average risk of breast/ovarian cancer, and she was diagnosed with stage 3 breast cancer in January 2012. The irony is that she received her diagnosis the day after she'd done a long training run in preparation for the London Marathon, for which she was raising money for a cancer charity. Both of Charlie's parents had had cancer, with her mother having beaten ovarian and breast cancer. Charlie fought the disease valiantly, and even took part in running races, cycle races and a triathlons over the four years in between undergoing courses of chemotherapy. But this "alien" as she called it was metastatic and it had spread to other parts of her body - initially the lymph nodes, her bones, then her lungs, and finally her liver and her brain. At that point treatment options were all but exhausted. I, and many of us thought that Charlie would beat it, as she was a fighter. But there's only a certain amount of fighting anyone can do. And Charlie did more than her fair share of fighting. A few days before she passed away, just aged 36, Charlie posted a quote on social media from a Harry Potter book - "After all, to the well-organised mind, death is but the next great adventure." So I am sure she is having a great adventure bike racing in her new place, teaching people about Latin and Ancient Greek (her other big passion), and free from pain. It is really hard to believe that she's not here anymore, and lots of people who met her said she made a difference to their lives - whether it was the women who got into cycle racing through her, the kids who developed an avid interest in studying Classics, the folks she had fun with at the rowing club, or just her friends and family who were touched by her warm smile and kindness. A public service to celebrate the life of Charlotte Easton is taking place on Thursday 6th October at 7pm in St Luke's Church, Balham, London SW12. Charlie's mum, Jacquelyn Easton is raising money for Macmillan cancer support. In mid-October she will be doing the Tyne Zip Wire Challenge - basically being whisked at a height across the River Tyne (Newcastle) on a zip wire from the Tyne Bridge (eek!) Check out Jackie's fundraising page. You can find out a bit about Charlie and her interesting exploits from her blog.